cho kawaii. ^_^ I love CCS. Wonderful.... especially the background :). I love it its so cute. I'm a big fan of Card Captor Sakura and seeing all three of my favorite girls in one wallpaper is a bonus. The edges are a little scratchy but other then that good job. Great background, very nicely done and quite colorful. 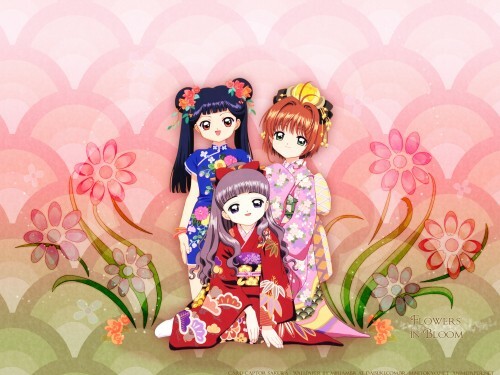 I like this wallpaper because the image is not overused and for once we have a trio as opposed to yet another solo Sakura wallpaper or Sakura and Shaoran wallie. Keep up the awesome work!